My schedule, like yours, has been hectic lately. I say yes to things and then wonder later, when stretched for time, why on earth I did. But as soon as one of those "yes's" happen I'm so very very glad I did. One of those things is teaching. I am always always glad when I get to teach something. It's always a huge amount of prep and means being somewhere not only on time, but ahead of time. It also means a chance to share something I love and it totally floats my boat. To encourage others, to inspire them, and to be that bit of God given synchronicity they sometimes need to jump start their creative lives. It's one of those things that you do that always seems to bless you more than anyone else present. New ideas, new friends, new conversations and sparks- all those things happen in the middle of a class setting. It just thrills me. But add the teaching, to publishing deadlines, school volunteer activities, bible study and the like I've been having trouble keeping my boats afloat. Lots of important stuff and sometimes I wonder if I should be saying "yes" to so much. The teaching however, seems so right. So important, and I love it so much. So to that I will say "yes" any chance I get. Maybe because I've made that commitment, some special teaching opportunities have come my way lately and cool as they are, I want to share them with you. First, I'll be teaching this October at the Creat-a-thon at Art 2 Heart. This is a special non profit shop near where I live that donates it's proceeds to help missions. I just had the opportunity to meet with one of it's participants and am IN LOVE with the enthusiasm that they bring to this mission. Each year they have a Creat-a-thon where creative people get together and craft the night away making unique handmade goods to sell in the shop. I'll be teaching one of my projects. But they're going to have a huge variety of stations, everything from cards, to serving ware will be created. I've just heard a quick overview of where their money and products go and I have to tell you it's impressive. Medical missions, rescue missions, gospel missions... I am SO SO excited to hook up with this group. I'm also going to be teaching in Houston, TX Nov. 2-4th at the Int'l Quilt Expo. I'll be participating in Make It University which is a Cloth Paper Scissors/Quilting Arts sponsored series of classes being offered during the Quilt Expo. If you've been thinking of attending I'd LOVE to see you! I'll also be teaching at ART is... YOU in Petaluma, California next September. I can not WAIT to experience this amazing art event. I love the thought of meeting more of you, getting to play with you, and sharing this experience with you. So although it's a year out, if you've ever thought of attending one of those big art retreats that everyone raves about.. DO THIS ONE! It would be so much fun! So check out the links, and just think about attending one of these wonderful events. I would love to meet you and I know we'd have a fabulous, amazing, write home about it, kind of time together. Thanks!!! We had the party in my backyard in a tent a friend loaned me. It was about the size of a carport and fit 3 5' round tables perfectly. We rented the chairs and tables from a local party store. I used natural materials from around our yard to decorate the tent poles and interior. We had grapevine, dried hydrangeas, and these annoying little trees that keep growing like weeds. So I cleaned up the yard a bit AND decorated the tent at the same time. BONUS! I also had a partial roll of white tulle ribbon, a large roll of vintage pink and white ribbon, and a lot of bits of vintage lace fabrics that my mom had scavenged for me. These I just hung everywhere to soften the interior of the tent. The absolute perfect finishing touch for the tent was the banner over the entrance. Etsy artist, The Mad Stamper makes these gorgeous banners for weddings, birthdays, and baby showers. The tables were covered with white table cloths layered, with vintage floral table cloths over the top. We used mis-matched plates and silverware, and the centerpiece of each table was the floral arrangement. I made three small bouquets of sunflowers, mums, roses, hydrangea, sedum, salal, and leucadendron. The vases had a illustrated sheet torn from a children's book and secured with string. Each was sitting on a pretty green and floral tray I picked up at the Junk Bonanza the week before. The apples on each tray (seen in the first pic shown) were put there just before the party by my cousin's almost three year old little boy. He picked them off the tree- how cute is that? 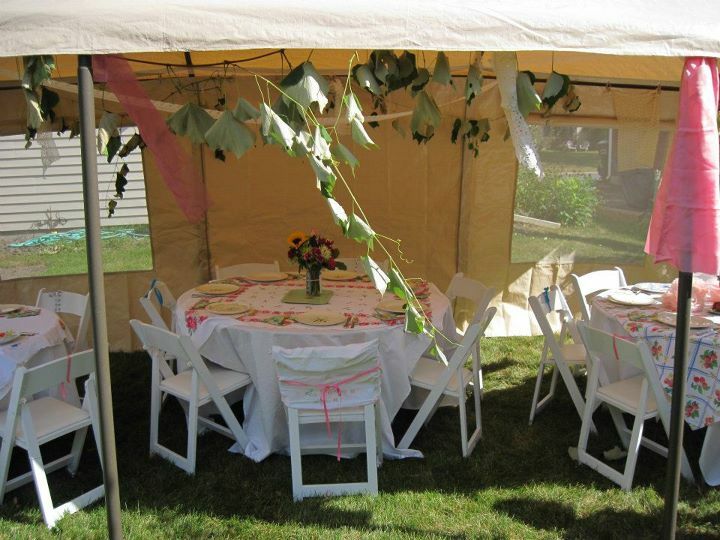 At the far end of the tent I had a huge arrangement set on a little white draped card table. It stopped the eye and made a visual end to the tent. It also worked great as a table to set the going away party favors, individually wrapped cake pops shaped like baby rattles. I have to say I'm starting to get a little addicted to making cake pops- they're just SO CUTE! I even made gluten free cakepops shaped like footballs for the boys watching football during the party. My son LOVES them. When the guests arrived at the party I had them go through the house and onto the deck before heading down to the tent. The front walk of my house, the deck, and the grass all had rose petals scattered. On the deck I had my little antique patio table set up with an arrangement, and handmade fabric corsages; one for each guest. I think I told you a few posts ago I was dyeing vintage fabrics and trims. I pinned each corsage to a piece of vintage children's book paper to keep the library theme going. The Mama to be got her own very special badge and her very own pillowcase draped chair. She looked beautiful! The party was mid afternoon so we served a light luncheon of salads, little open faced cucumber sandwiches, caramel toffee scones, raspberry tarts, and cake balls. For drinks we had a bowl of punch and one of cider. We had planned on tea but it was such a warm day we didn't bother with hot drinks. We ate after the guests arrived, opened presents, and then served chocolate mousse in little glass trifle and cognac dishes my mother and I had been picking up at thrift shops all summer. I honestly didn't think anyone would finish theirs after everything else but most everyone took one. They looked so pretty I don't think they could refuse. Plus, my mom does make a mean chocolate mousse. 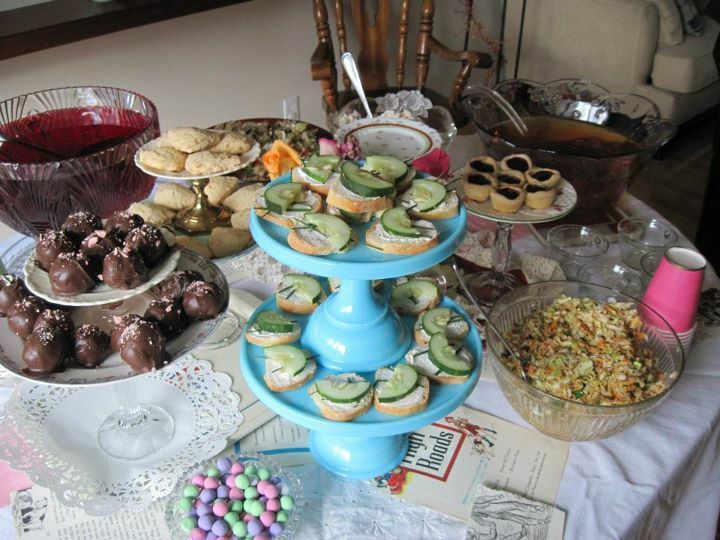 :) The refreshments were served on these sweet little pedestal plates my mom makes from beautiful old dishes and sells in her etsy shop. We stacked them for a gorgeous vintage look. To pull the library theme in one more time I scattered more vintage children's book paper on the serving table. I know this was a HUGE post but I really appreciated finding information on other websites about baby showers and thought I'd do a really thorough post with lots and lots of details for anyone else who might want to plan their own vintage style event. I hope you enjoyed the pics! My Painted Tree Tee: Altered T-shirt Challenge Results!! Wow- I have SO much to tell all of you about The Creative Connection Event I attended last week. I swear I could do a week's worth of blog posts just about what I heard, saw, and learned. techniques I use most in my art to alter the t-shirt. So that is what I did. 1. First thing I did was paint directly on the shirt. To do this I had a piece of cardboard that I stuck into the t-shirt and then pulling the front slightly taut I clipped the two sides of the t-shirt to the board with clothespins. Then I was able to paint directly on the shirt. I wanted to try using acyrilcs. I have a friend who swears they're no different then fabric paints so I thought I go with what I have and not go buy a bunch of fabric paints for this project. 2.After I painted the tree shape I added some blues to the background in a sort of cross hatch pattern. 3.Then, I cut out some leaf shapes from different printed green fabrics I had. I varied my sizes a bit. 4. Using embroidery floss and a needle, I straight stitched around the leaves.Knot and trim loose threads close. 6. Using clear acrylic stamps and an ink pad stamp I stamped my phrases on the shirt. Then, to embellish the words a bit I used my rubber brush to create little stitch marks around the words. Just ink the tip a bit and press- it's SO easy! And that, my friends, was all I did. Not hard, a little bit of time, but very very easy. And I feel like I'm wearing one of my mini art quilts which is pretty fun. NOW- head on over to Shelley's blog and add your OWN creation. I'm on my way there now but here's the link. Thanks for viewing and happy Altering!!!!! * My usual is to iron my fabric to heat n bond prior to cutting out the shapes. With the paper backing of the heat in bond still attached, I'll cut out my shapes. This way if I want to sketch out my shapes on the paper as a pattern I can. Usually I just free cut however. Peel away the backing, and then straight stitch around the leaves. Finally, to adhere, you just iron leaves in place on shirt. This eliminates the possibility of the fabric fraying in the wash. This time I thought I'd experiment with adhesives a bit which is why I used the liquid stitch. It seems to have worked great thus far. I've found that challenges are a great way to unstick me and get me to try new things. I'm always glad I did! So feeling in need of a challenge, I'm gonna do another, and This time, for this challenge, I'd like you to join me. Shelley, from Single Stone Studios, (who's much more technically savvy then myself) has a video or two on her blog telling you a little more about it. Please hop on over and check it out. Seriously, this is just scratching the surface of what you can do with this surface. So pull out those plain, solid color tees and PLAY! On September 21st we're going to set up a link party and would LOVE to have you join us. We want to see what YOU do! So show us your favorite recreation and we'll show you ours-I can't wait! I've noticed that it's stash busting week over at interweave- noticed because each of their daily e-mails has mentioned stashes. Little projects seem to be the best way to bust your stash. And things like the little embellishment at left is a good example. It's little, it's cute, it uses lots and lots of bits of materials.It can be an embellishment to add to your next mixed media piece or add a pin back to it and you've got a lovely, one of a kind brooch. Of course, as a brooch you might want to ditch the clothespins. I like clothespins however, and if I were to make this into a larger mixed media work I would definitely keep the clothespins. To make your own artsy clothespins all you need is a few clothespins, some permanent ink, and stamps. And who can't scrounge those from somewhere around their stash? Ok, so maybe not all who are reading happen to have clothespins, or permanent ink, or stamps so if not, they are very very easy to procure. Actually, your local Michael's or JoAnn can be a one stop shop. The clothespins hide in the wooden cut out aisle, the ink and stamps can be found in scrapbooking. It really is the little details that I love to indulge myself in when I'm creating a work of mixed media. And it's so easy to make a bunch up and then they'll be ready for your next burst of inspiration. Have fun! On Wednesday this week I decided to register for The Creative Connection event that's being held here in a week's time. I've hemmed and hawed about it since March. I wanted to go but couldn't really see the expense after my jaunt to CHA in July. But God made a way on Tuesday so my husband said to go ahead. I registered for two days and am taking a class by the Crafty Chica about setting up an online classroom. That sounds cool. I'm also registered for Tracy Bautista's Making a Living as an Artist class. Those were the two classes that really hooked me. Because they were on two seperate days I (oh,no) had to register for two days which left me with two afternoon slots open for classes.(hee. hee). SO I get to justify another one of Kaari Meng's amazing classes and a class by Princess Lazertron. It really would have been too hard to go and not take ANY of the amazing handmade classes. So it worked out well in that respect. I'm excited (whoo-hoo), but then I started to think about what to wear. Now I have some really nice clothes from when I attended last year, and I have my super cute doily dress but a girl wants something new when she goes to one of these things. So I got creative and spying a big ol' fitted sheet that I'd just torn into strips to dye I got an idea. It was right then that my husband called and asked what I was doing. "I'm wrapping a torn bedskirt around my waist to see if I can make a skirt from it" seemed a little risky to share.So I tried to get off with a "trying to figure out what to wear next week to the conference." But I think I must have sounded a little evasive as he immediately asked a follow up question. So I told him. After a moment of silence he said we could probably afford to get me something new from an actual store- I didn't have to make a skirt from an old bed sheet. But by now the idea had taken root and I had images of skirts by gibbous fashions and Ruth Rae's poetry pinafores dancing around my head- inspiration had struck. So obsessively I sewed last night and this morning till it's almost finished. It's all hand stitched and uses only fabrics that I had on hand, most had been given me. I dyed them all using the blue one step dye by tulip diluted with water in a plastic container. So take a look and see what you think- thanks :). Step One: Before stitching the ends of the skirt strip together I added an additional strip of the sheet fabric to the bottom of my skirt base to lengthen it a bit. To do this I just straight stitched it through the overlapping fabrics. Then, overlap the two side edges about 1 1/2" and then stitch a double line of straight stitches down the length of the skirt. The skirt is already gathered at the top bc we're using the gathered side of the strip as our waistband. Step Two: Free cut out the scallops and fringe for the bottom of the skirt of canvas. Stitch below the seam that joins your two lengths of fabric. Step Three: Cut strips of a contrasting fabric and straight stitch on either side of center seam to form panels. Add tall thin strips of tarlatan on either side of these panels. Step Four: You can leave your skirt as is, but I wanted it to look a little more artsy so I added two pockets assymetrically placed on either side of the center seam. Step Five: Add buttons to the center seam and then add trims and buttons to the rest of the skirt as desired. Step Six: At any time you may decide to add some stamped images or text. I used a roller stamp with a cursive font wherever I wanted a little more detail. I think I've mentioned before that my mom is a teacher. My dad is a teacher. My grandmother, aunts and great aunts are all teachers. It runs in the family and if you're in my family and are not a teacher it's because you ran from it. I was in that ran from it category most of my growing up. I saw how many hours my mom and dad would put into their jobs. They'd spend long days at school and then come home and correct papers. It truly is a mission field and not an easy one. The rewards are purely emotional as you see children grow and learn and develop. But that's at the cost of family, of free time, of salary. Teachers are generally quite underpaid. My dad had three jobs the entire time I was living at home. That lovely three months off in the summer? Well, they don't get paid for those three months and so most teachers find themselves competing with their own students for summer jobs painting or clerking, or as camp counselors. Coming from my background it's easy to see how I can feel a sense of responsibility to the make sure the teachers in my son's life feel valued. So when I have the chance to help a little or to slip them little gifts I make sure I take advantage of the opportunity. The first day of school is one of those occasions. Teachers have been planning and cutting, and readying their classrooms for this day for over a month so to say thanks I had my mom make one of her teacher themed clipboards as a present, and I made a little blank notebook from an old afternoon reader book I found at a thrift store. Then to make it a little extra special (and practical) I clipped on a gift card for one of our local coffee shops. Because trust me, teachers need the caffeine as much, if not more, then we do. SO PLEASE feel free and make up your own occasions to pamper the teachers in your world. The end of the first week, the first month, the first quarter. Anything will do. But show them some appreciation- trust me they will appreciate way more then you'd ever guess. AND if you are a teacher or have done something creative for a teacher in your life please let us know about it by leaving a comment- Thanks!!! 5. Add wire binding and pinch close with Cinch to finish! This was just a quickie tutorial for a more in depth how-to see the Vintage Book>Notebook tutorial- Thanks for Reading!!!! Dyeing to Try Something New? A few weeks ago my dad was unwrapping some garage sale donations he'd received for the charity garage sale he was running. They were little knick knacks that someone had packed away a long time ago. The cool thing is that each little schotzke was wrapped in fabric. My dad, sweetie that he is, put it all aside for me to go through. I think the lady who originally packed everything must have sewed a few fancy dresses in her time, because there was a lot of lining fabric and satins. There were some brocades, some curtain fabrics, and one big piece turned out to be a dress that had been cut apart. I have no idea how to date fabric but the dress looked like something from the late '60's early 70's. I wasn't crazy about the baby blue brocade or all the white and cream so I decided to try dyeing them other colors. I had some of Tulip's one step dye's from another project and so I used the blue and pink. The colors were lovely saturated hues but turned out a little too bright for the vintage style project I have in mind so I decided to try over dyeing them with tea. A quick trip to the thrift store, and I had this super cute old kettle to use for the tea dyeing. As I reached for the tea in the cupboard though I realized that I only had green and chamomile teas (which wouldn't give me the brown I was looking for). I did however, have a pot of really dark coffee sitting there so that went into the pot with the water I'd been heating for the tea. That diluted the coffee quite a bit so the results weren't as vintage-y distressed as I wanted. But, it did mute the colors quite nicely. They're quite lovely now. I also tried playing with a few other ways of altering the fabric and trims I had. So that's the something new I decided to try this week. Here's some pics- Enjoy! Here I'm using Staz-on ink and a roller stamp and rolling over the fabric in different directions. Pretty! I've been playing a bit with a few distress stains I picked up and one of the things I've found I like them for is adding a little additional color to my dyed trims. It makes them two toned in just the right spots. I also tried using the distress stain on some cheap cream lace ribbon I got somewhere. This particular material didn't take to the one step dye's too well, but it did work quite well to apply the stain directly to the trim. I haven't tried any of these for permanancy yet. As I'm thinking of making corsages with them I'm not too concerned that they're washable.